Even though we finished classes and exams last Wednesday before the four day Easter weekend (Friday-Monday) our school officially closes today. This means kids will go home for term break. All kids except 40 who will stay for the regional sport competition held at our school. Tomorrow, 80 kids and about 20 teachers from two other schools for the deaf will arrive. Then we have sport events Thursday-Saturday and they’ll leave Sunday morning. It should be a busy week but hopefully fun! During the last presidential election in Kenya there was violence which resulted in the evacuation of Peace Corps Volunteers. This time around Peace Corps wanted to be prepared in case we needed to be evacuated for this year’s presidential election. All 110 PCVs met up in a nice remote area for consolidation. We spent about a week and half there. It’s not often that PCVs get to meet so many other PCVs in their country so it was a great experience! For the most part, things were calm across the country so we got to return to our sites via Peace Corps vehicles (was SO nice not having to drag all of our things across Kenya via public transportation). The week prior to and after consolidation I think was stressful for most of us. We didn’t know if we would ever return to our villages again, we didn’t know if we should say good-bye to our students/community members, we didn’t know if we would get to see loved ones in the States who we hadn’t seen in over a year, we didn’t know if we would be living in the States or Kenya in just a few weeks, we didn’t know if we would have a job in just a couple of weeks…..then there was the packing! We had to make an inventory of everything in our house, pack things up to the point where if we were evacuated then certain things we left behind would be shipped to us yet not pack everything up in case we did come back, we had to make a few piles (things to be shipped, things to give to people, things to take with us to consolidation, PC properties, etc). Then once we returned to sites we had to unpack everything, get settled back into things, come to terms that we were going to be able to continue our job and projects in Kenya, and readjust to Kenya culture after getting to be ourselves without judgement around other Americans for a week and half. Things are great now! I’m back into the flow of things and am glad to be back at my site with my kiddos! It’s crazy though, the first term is coming to an end already!! Final exams should be this coming week then we will start the annual sports events that occur during the first term. Hopefully I’ll do a bit better about blogging. It’s kind of hard now because I’ve forgotten what isn’t “normal” to Americans. What was at one point new and unusual to me is part of my daily life and I don’t think about it as much anymore. 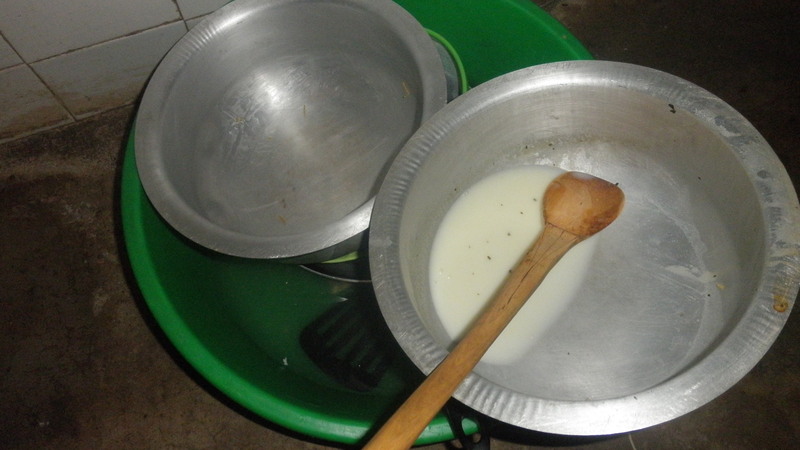 Cooking can easily take all day in Kenya if you cook Kenya food. 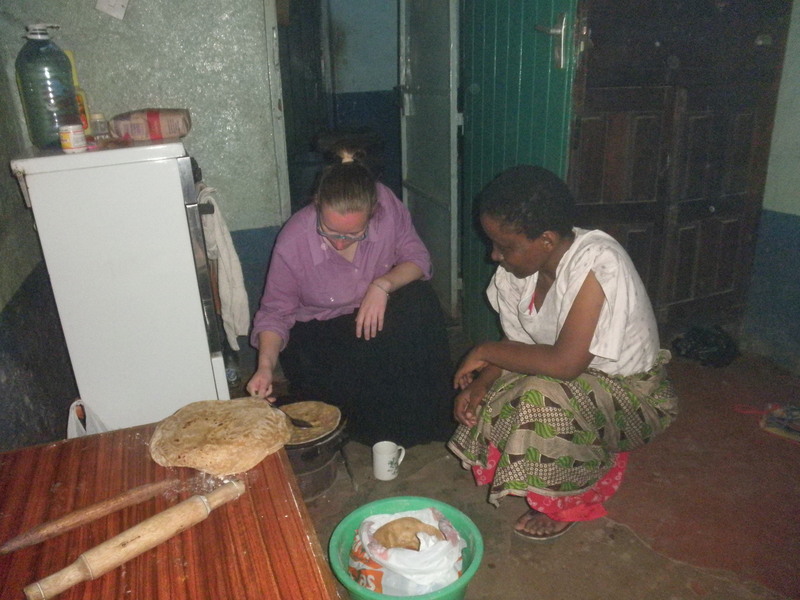 Every once in a while I make chapatis but that’s usually the only Kenyan food I make..
My second host sister teaching me how to make chapatis on a jiko stove (my first host family had a family emergency so I ended up getting moved to a second host family during training). 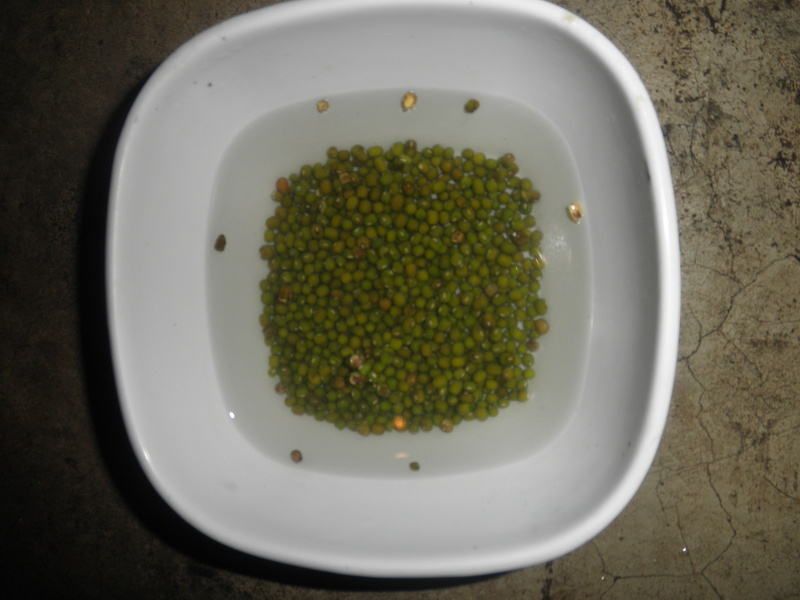 If you want green grams or beans with your meal then you need to soak them in water the night before so that they soften up enough to cook. 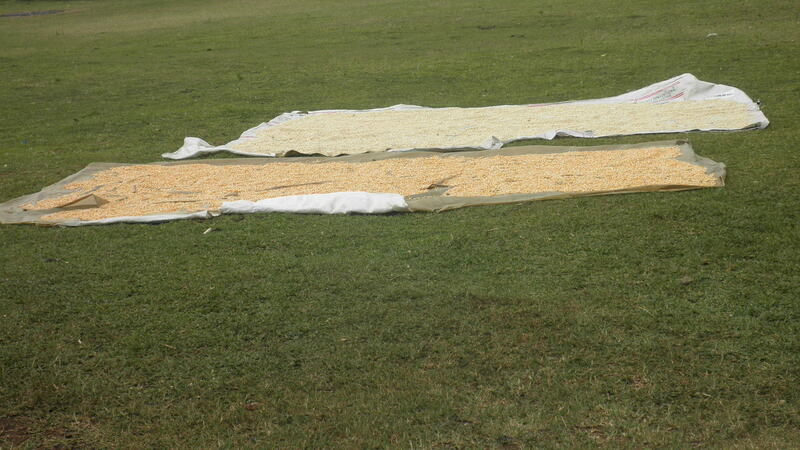 Same with maize (corn), they need to sit out in the sun to soften up. Like most PCVs, I stick with simple and food that’s quick to cook (e.g. spaghetti…I’ve never eaten so much spaghetti in my life before). I also usually add Sossi which is soya (good source of protein) since it’s not exactly sanitary (by my standards) or easy to purchase meat in my village. Meat is usually very tough and sits out in the sun for weeks until it’s all sold. My school actually spent about 2-3 weeks eating meat from a cow that had to be killed due to an illness (no refrigerator or freezer….just tree shade). 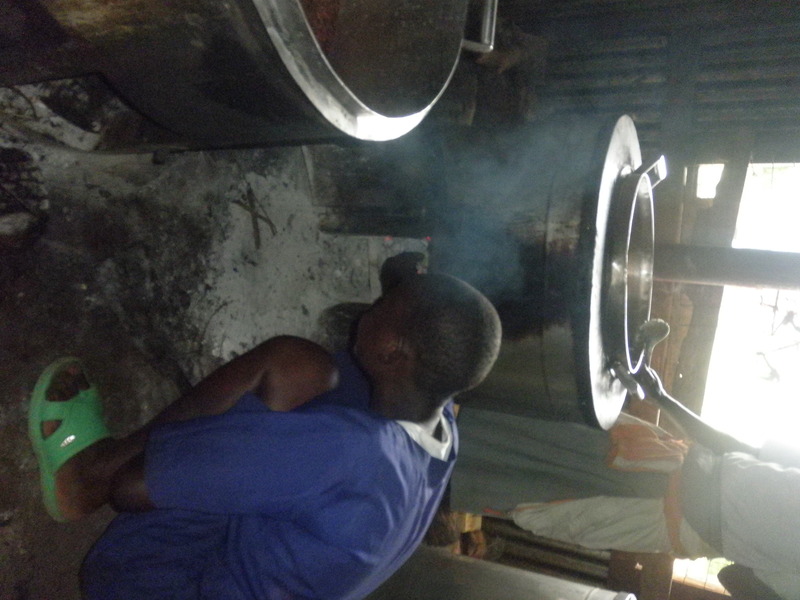 Kenyans may cook outside or inside with gas, kerosene, charcoal (jiko stove) or firewood. Most people in my village do not use gas tanks. There aren’t any gas pipes that lead to houses, instead people travel to town to purchase gas tanks which can be a pain to transport back. 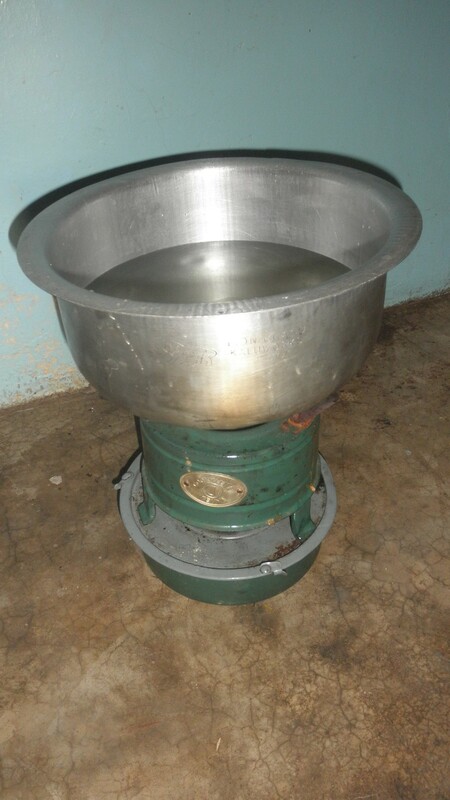 My first host family lived in town so they used a gas tank and a jiko stove. 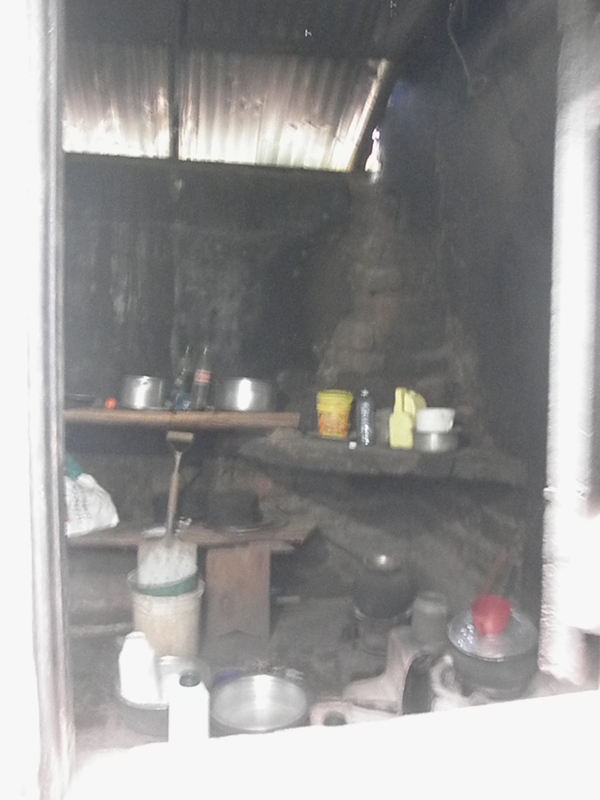 My second host family lived out in the village and used wood to cook and a jiko stove. They would chop down tree branches and carry them to the house on their back. My second host family’s kitchen. The red cup is on top of a pot which is where the stove is. My first host family’s kitchen. The gas tank is black, most tanks I’ve seen are about half this size. I use kerosene which is around 80-90/= per litre, lasts for a while (around 400/= worth lasts a few months), and easy to transport. I use a kerosene stove. I light up all 8 wicks (it’s a pain to switch out the wicks when they get short) and hope a flame ball doesn’t shoot up. Sometimes I’ll be cooking something before I realize I’ve just about ran out of kerosene ….this happens every once in a while and ends up doubling my cooking time. I only have one stove so if I want to make spaghetti with white sauce and garlic bread then I time it so that I can still have warm food to eat after cooking one item at a time…it does take longer cooking one item at a time instead of all at once. 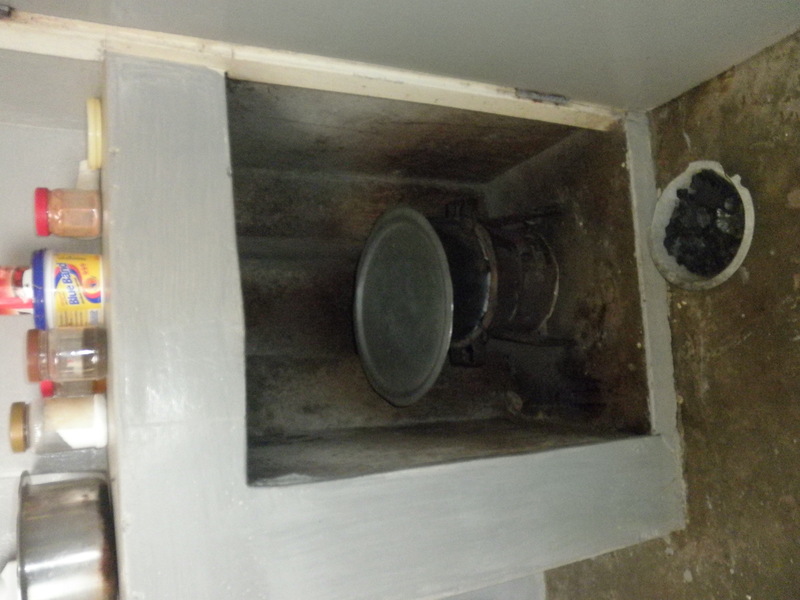 The downside to kerosene is when you get the smoke in your eyes and it’s a pain to clean the bottom of pots….ugh! 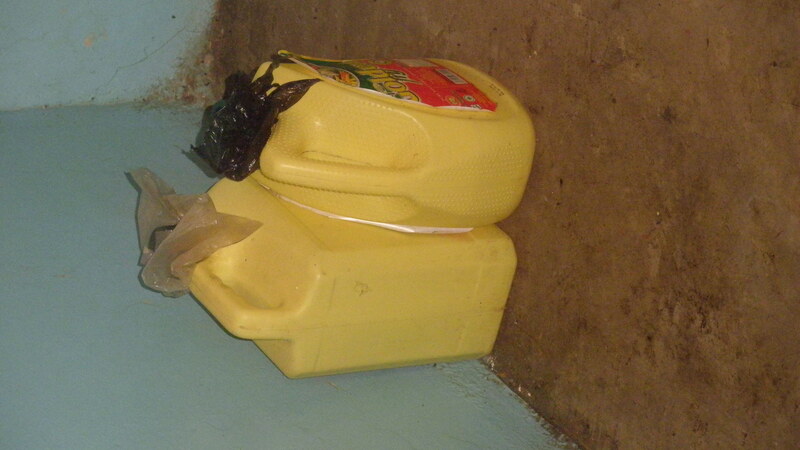 Yellow containers are reused cooking oil containers (Kenyans use SO much cooking oil) which are resold to be used as kerosene containers or to transport water. You see them all over the place in Kenya. When I need to get kerosene I wait 1-2 hours by the side of my dirt road for a vehicle, travel about an hour to town, hope I can get kerosene at the first gas station I go to (sometimes stations run out of kerosene), if the gas station is busy then I have to push my way through and stick the yellow container in front of the person who is doing the filling (they have an employer who does it and there is no concept of lines or going in order in Kenya….it’s all about pushing your way through) then it takes 0.5-4 hours to get a vehicle to leave town, and another hour back to the village. I have spilled kerosene all over my pants before while traveling on the bumpy dirt road….am just glad no one near me lit a match! One has to make sure they don’t run out of gas or kerosene completely….which is so easy to do. If I’m low on kerosene and I know I won’t be able to make it to town for a few days I’ll either eat a lot of PBJ sandwiches or something that’s very quick to cook (e.g. scrambled eggs). It’s Monday which means time for another “How Do I….” post?! I typically throw dishes and pots into a basin that’s 1/3 full of water since I don’t have running water or a sink. This basin is in my “washroom” which is just an empty room with a small drainage that goes outside and is where I do all of my cleaning at (bathing, washing dishes, washing clothes, etc). Yes, the basin is on the floor….lots of things get done on the floor around here (bathing, cooking, washing dishes, washing clothes). 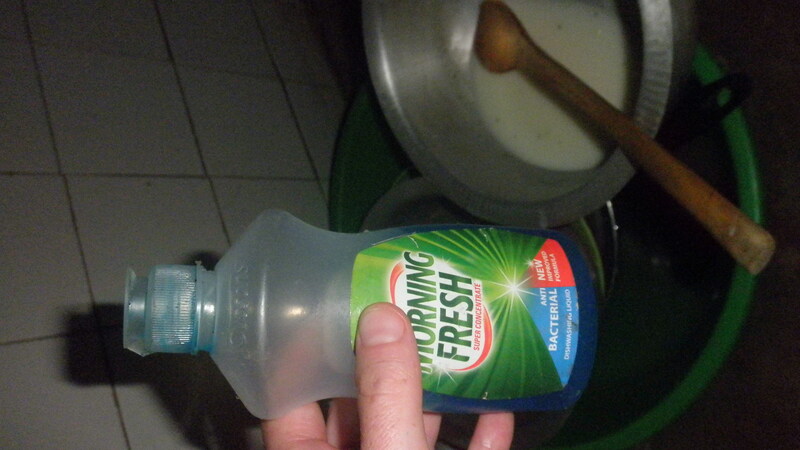 I then add dish soap (by the time I get a vehicle to go to town and return back to my village…it can take 4-6 hours to get this bottle of soap) to the basin. Oftentimes the weather affects what I cook. If we’re in a dry spell then I’m more aware of what I cook. For example I may eat a PBJ sandwich and a boiled egg for one meal which requires minimal water to cook and clean up. I may choose to make spaghetti instead of pancakes…again, less water needed to clean up afterwards. I use a small pitcher to clean pots since it’s a lot easier to use less water that way instead of filling up the basin full of water. If I’ve had an easy lunch (e.g. PBJ sandwich) then I just reuse the water for clean-up after dinner if it’s clean enough. Since I have cockroaches, bats, spiders, etc. crawling around I wash my plate and fork right before I put my food on it even though I just washed them the day before. Then, depending on what was cooked….I either sweep or mop up the floor! 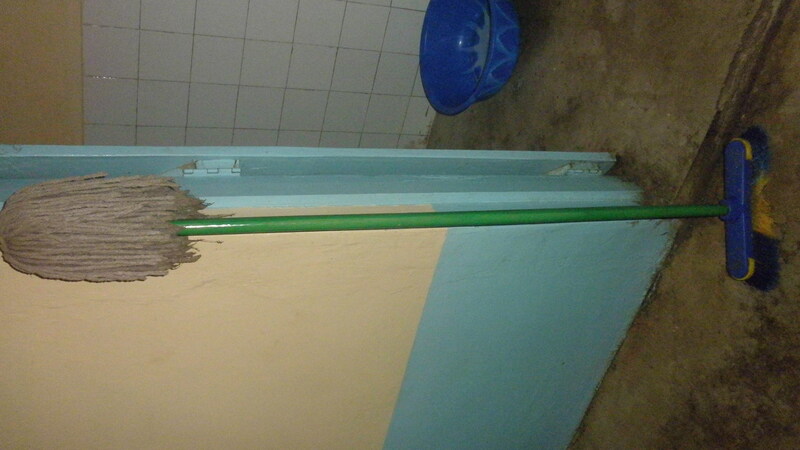 I was able to grab this broom a while back from town (vs the typical Kenya broom which I do use from time to time). I later found a mop attachment which didn’t fit and the broom attachment wouldn’t come off so I ended up whittling down one end of the broom to attach the mop….hey…it works. How Do I…..Use the Restroom? A choo is an outhouse. I do not have my own choo, so I share one with the headmaster, boys housemama, deputy headmaster, and the headmasters’ housegirls (it is common for middle class Kenyans to have housegirls who will clean, take care of young ones, etc.) The choo is at the other end of the school campus from my house. 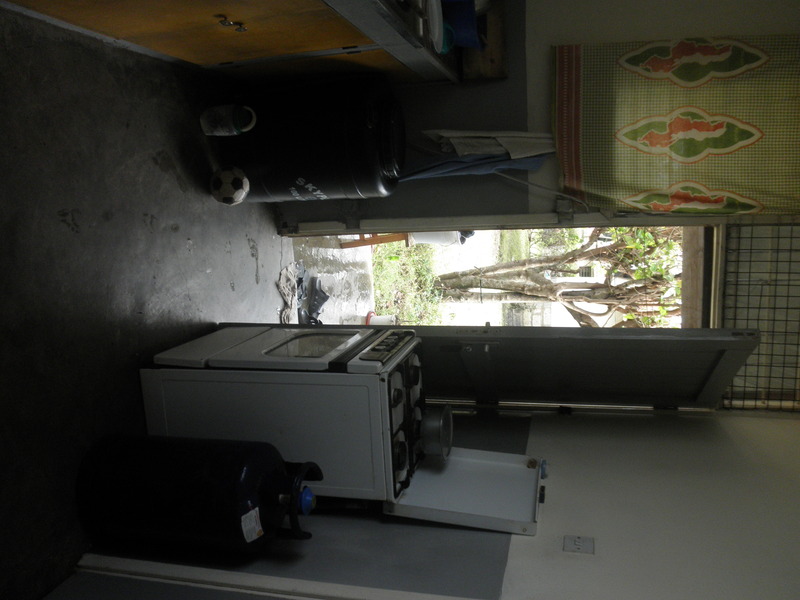 The door on the left is the choo and the blue door on the right is the washroom for the headmaster/deputy headmaster/boys housemama/etc) (lucky I have a room in my house that I can use as a washroom). 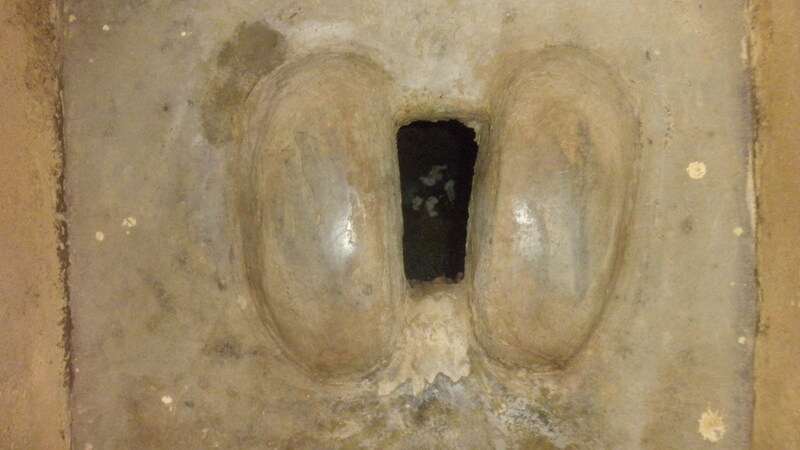 Where you squat down and do your business in a hole. Our choo is usually clean most of the time (except when we have visitors) since the kids are responsible for cleaning the choos on a daily basis. No one can ever aim into the hole…..just sayin’. On bad days, there will be flies that fly up and hit your behind….so glad that doesn’t happen often though. There are geckos that live in there, they scurry away whenever I open the door. So far I haven’t seen any snakes but I do have to keep that in mind and do a quick snake check before I enter. Our school is wonderful about cleanliness…the kids even bath twice a day. 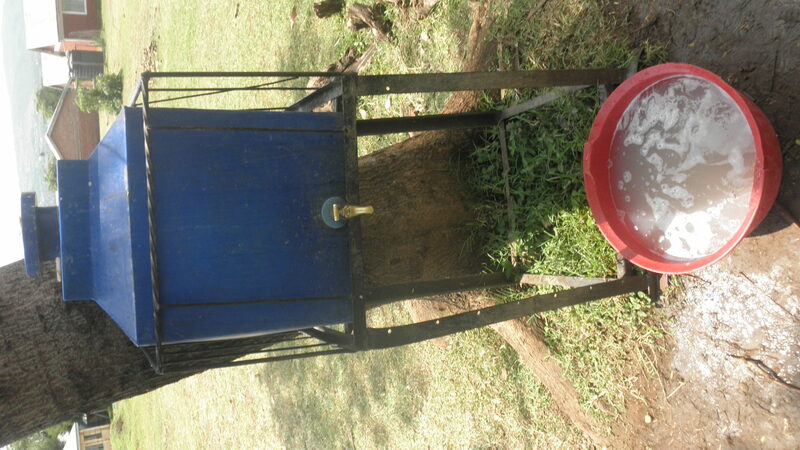 We also have washing stations like this one outside of the choo. 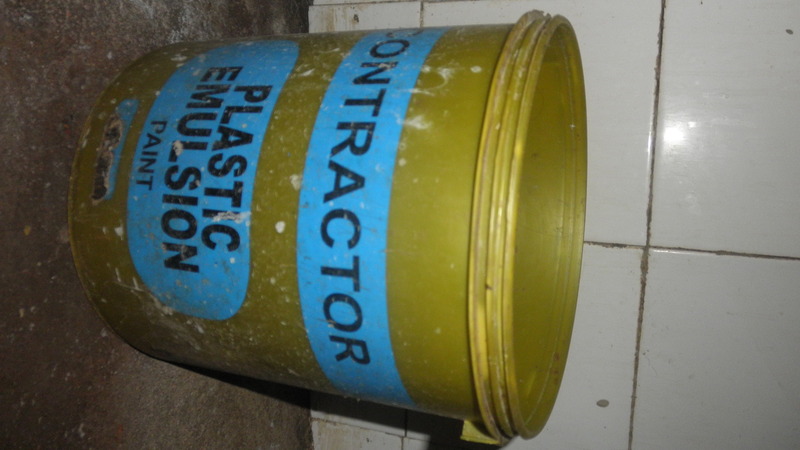 During the dry season we keep the water that ends up in the basin and it’s either put back in the blue container to be used again (if it’s soapy enough) or used to mop classroom floors. 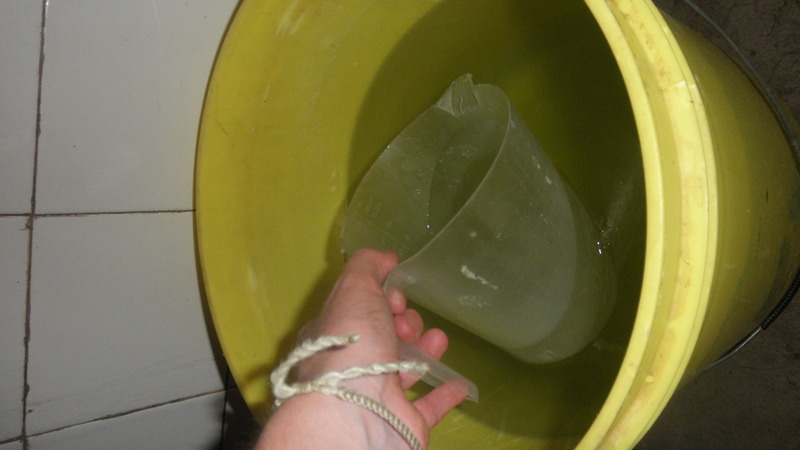 One tip if you ever visit Kenya…always, always, always carry toilet paper with you. 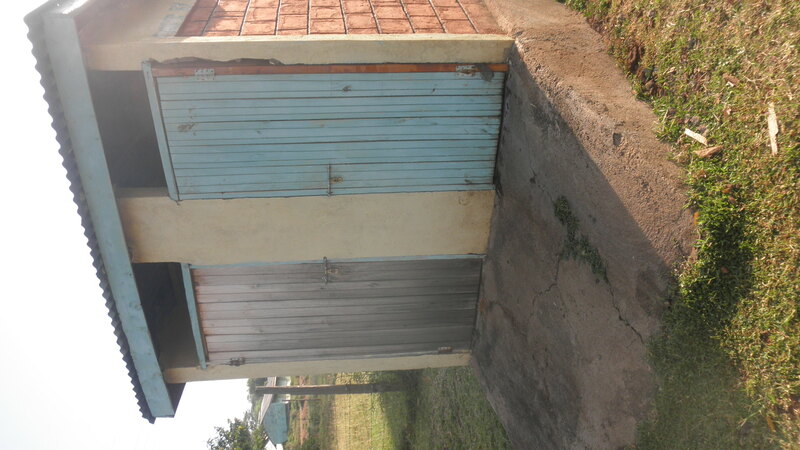 They’re not provided in choos and most public restrooms do not provide them either….